Carte de la Confederation Germanique. 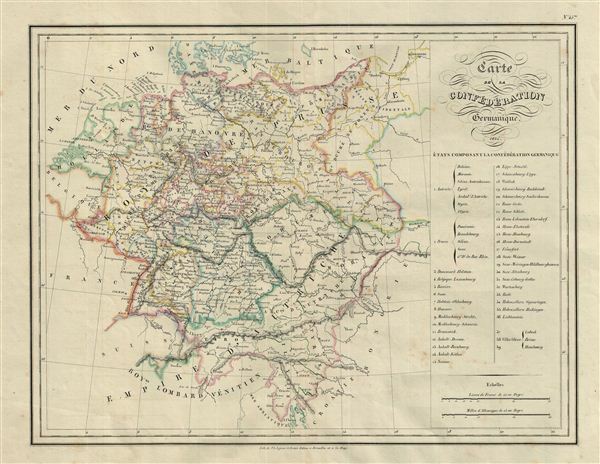 This is a fine example of Conrad Malte-Brun's 1835 map of the Germanic Confederation. The map covers Germany and the Netherlands from Denmark to Croatia and the Adriatic Sea. A table along the right margin lists the states comprising the Germanic Confederation. The modern day countries of Poland, Czech Republic and Austria are included. Boundaries are color coded according to states and districts. Various cities, towns, rivers, lakes and other topographical details are marked, with relief shown by hachures. This map was issued as plate no. 45 in Conrad Malte-Brun's 1837 Atlas Complet du Precis de la Geographie Universelle. Very good. Original centerfold. Light foxing. Blank on verso. Rumsey 0458.040 (1834 edition). Phillips (Atlases) 6079.